23 to 24 weeks - you seemed to grow a noticeable amount! You still have the cutest bump - love it! 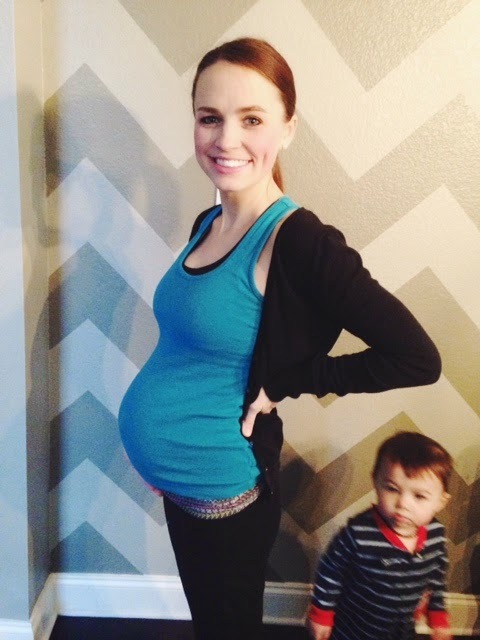 Your bump is the cutest! You look great even if you are sick! So cute Ruthie! You wear pregnancy so well! You look beautiful and your baby bump is so cute! Hope you feel better! It's so crazy how fast the bump grows - I feel like mine seriously grew a lot LAST NIGHT. Love everything about this post. You're adorable and so are both your kiddos, and I can't wait to see you so so soon!!! Also, I can't believe it's already time to schedule your c-section! We'll be scheduling ours come April and I know that's going to be basically tomorrow (or feel like it anyway). It goes faster and faster each time! So glad that things are going well. I love the little blur of Ford in the background :) You're doing awesome Ruthie!